The 6-turbine Pentland Road Windfarm site is located to the south west of Stornoway. Although the application has been before Comhairle nan Eilean Siar Committee and approved on a number of occasion, construction still has not started and it is now possible that the application will be subject to a public inquiry. The following account of events surrounding the proposal was first published by Views of Scotland, and is reproduced here with thanks. Initially, the aviation authorities, NATS and HIAL, objected to the Pentland Road proposal on the grounds of the potential impact of the six-turbine site on Stornoway Airport. As it lies on the Lewis Peatlands Special Protection Area/RAMSAR site, SNH also objected – on the grounds of potential adverse impact on an SPA. The European Union's Birds and Habitats Directives set strict criteria for developments on SPAs that are not compatible with the site’s conservation objectives. An ‘Appropriate Assessment’ must be made to assess if there is likely to be significant environmental impact. If so, development can only proceed if it is shown that there is an ‘over-riding public interest’. SNH argued that insufficient information had been provided on the risk to Golden Eagles breeding nearby and queried the merit of the theoretical models used in estimating that risk. In June 2003, CNES recommended approval subject to the resolution of these outstanding issues. Objectors take the view that Pentland Road only obtained consent because of the premature withdrawal of objections by SNH, that SNH failed to address many of the issues raised in the Environmental Statement, that it relied on inadequate evidence to justify withdrawing its objection and, most notably, that it failed to ensure that its own guidelines for best practice were adhered to. SNH withdrew its objection in August, claiming that it now had information enabling it to conclude that there would be no adverse impacts. The island community had generally welcomed renewable energy projects but details were now emerging about the unprecedented scale of the wind sites proposed for Lewis. It was very different from what they had been led to believe would be a ‘sustainable future’ and concern was growing about what was taking place.
. SNH guidelines call for raptors to be observed for at least a year properly to identify flight habits. Farm Energy's eagle survey had been conducted over two months.
. The Scottish Executive had deemed the collision risk model used as unsuitable for SPAs.
. The model used to predict the eagle’s range was inappropriate for the Western Isles. Despite this, the flight data did appear to support the predicted core range. 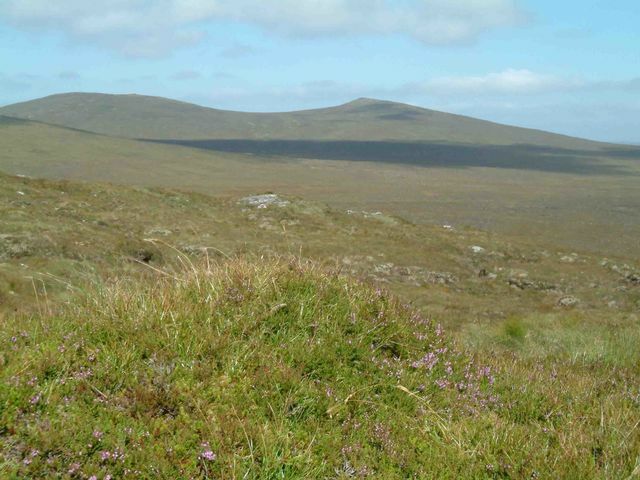 In July 2003 a one-day survey was carried out by local SNH Officers. Finding only two pairs of grouse within 750m of the proposed turbines, they concluded that this would not represent a significant loss of prey. SNH also reported that it had received information from ‘other wildlife consultants’ that the eagles were more frequently seen to the north west of the development area. (The nature and status of this information is unknown). Apparently on this basis, SNH concluded ‘that the predicted core range stated in the ES does not reflect the eagles’ actual range use.’ (letter to CNES, 29 August 2003) – and withdrew it’s objection. By spring 2004, the application was in the hands of the Scottish Executive. The RSPB was now taking an interest in the site and submitted a representation to Scottish ministers, who also received about 150 objections from the public. However, the application was returned to CNES in July 2004 with the instruction ‘your council are hereby authorised to deal with the application in the manner they think fit’ and asking it to address the concerns of the aviation authorities so their objection could be withdrawn. Since the last Report to Committee, objections have been received. They focus on likely adverse impact on the Lewis Peatlands SPA and RAMSAR site and claim inadequacies in the Environmental assessment. These issues were considered carefully last year. SNH objected initially but, after further study, removed its objection. Accordingly, an Appropriate Assessment (which is required by the Habitats Regulations) was made.